The stage version of the hugely popular 2013 animated Disney film is one of the most successful such adaptations, though certainly, by now, the Disney machine has the formula down to a science. The show tried out in Denver last September. Satisfyingly cast with powerhouse performers Cassie Levy and Patti Murin beautifully embodying the roles voiced by Idina Menzel and Kristen Bell in the film. But there’s astute casting all down the line. So, too, there are the expected magical scenic effects designed by Jeremy Chernick to go with Christopher Oram’s richly designed set and costumes. 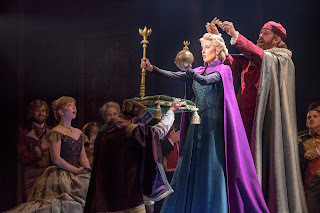 The plot will be familiar to fans of the film, concerning as it does the two daughters, Elsa (Ayla Schwartz/Levy) and Anna (Matta Conforti/Murin) of Queen Iduna (Ann Sanders) and King Agnarr (James Brown III) in the kingdom of Arendelle. Elsa has inherited magical powers involving snow and ice which, it soon becomes apparent, she doesn’t yet know how to contain. When one of her feats nearly kills kid sister Anna, the parents decide the girls must be kept apart for their own good. Years pass, and at Elsa’s coronation, Anna meets and falls in love with Hans (John Riddle), a youthful prince from a neighboring kingdom. Elsa forbids their engagement, and in the fracas, inadvertently sets off an eternal winter in the kingdom, and horrified even though she doesn’t know half about the damage she’s caused, she flees the castle to live in an isolated ice palace. The intrepid Anna goes off to help her sister, leaving Hans in charge. Anna is helped on her journey by mountain man Kristoff (Jelani Alladin) and his trusty reindeer Sven (Andrew Pirozzi). And they are joined by an anthropomorphized snowman Olaf (Greg Hildreth who handles the puppetry, designed by Michael Curry, and acts the role). He’s good, and the Olaf puppet matches his cartoon image, but somehow the device isn’t quite successful. Director/choreographer Rob Ashford handles the dances including the witty “Hygge” number for trading post proprietor Oaken (Kevin Del Aguila) and the travelers, culminating in, of all crazy things, a naked kick line (G-rated, of course). Levy brings down the house with the big ballad “Let It Go” (which includes an eye-popping costume change), and makes the number (memorably belted by Menzel in the film) her own. Murin’s big moment comes near the end with a lovely new ballad, “True Love,” very touchingly sung. Vocalizing aside, the absolute sincerity of their performances really impresses. Levy captures Elsa’s imperious, conscientious, and perfectionist qualities, while Murin conveys Anna’s spunkiness, fierce loyalty, and sense of fun. 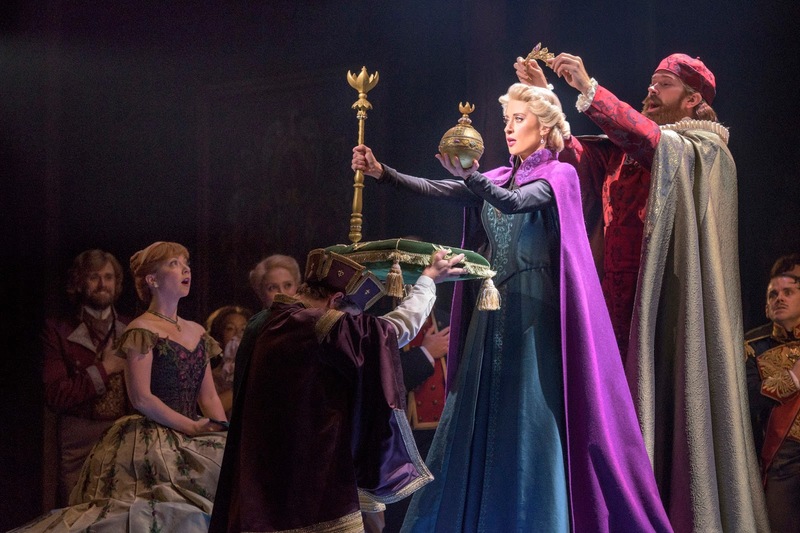 Anna and Hans’ “Love Is An Open Door” duet at the coronation is delightfully performed, and Ashford’s given them some very amusing knockabout moves for their dance. Of the new songs, Hans’ introductory “Hans of the Southern Isles,” Anna and Kristoff’s cute “What Do You Know About Love?” duet and Elsa’s “Monster” ballad are further standouts. As with the film, the plot isn’t entirely plausible, even in fairy tale terms, but the whole enterprise is definitely more satisfying than not, and fans of the film (especially the young ones) will not be disappointed, even with the necessary omission of some of the film’s purely action sequences. The blue chip design team also includes Natasha Katz (lighting), Peter Hylenski (sound), Finn Ross (video), David Brian Brown (hair), Anne Ford-Coates (makeup). Music supervisor Stephen Oremus did the satisfying vocal, incidental and dance arrangements. and Dave Metzger the orchestrations, under Music Director Brian Usifer.